Before beginning an in-depth discussion of circulatory physiology it is helpful to outline some basic hemodynamic data within the different functional segments of the vasculature. Blood Pressures within the vasculature vary widely and fall as blood progresses through the circulation. However, blood pressure does not fall linearly and instead makes its steepest descent at the level of arterioles which offer the greatest resistance to blood flow. Systolic and diastolic fluctuations in the pressure of blood are observed within the aorta and arteries and are largely damped after blood progresses through the arterioles. 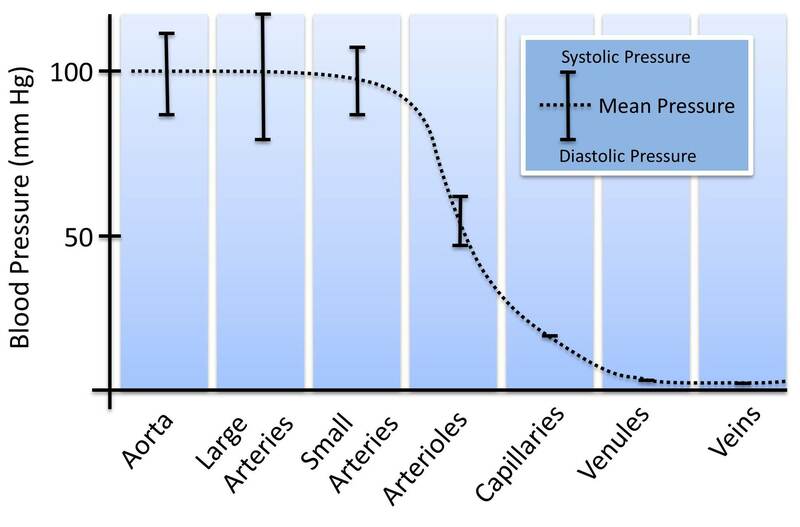 The graph below displays the blood pressure profile for the systemic circulation. The same pattern is observed in the pulmonary circulation; however, the pressures are in general much lower. For example, pulmonary arterial pressures average 15 mm Hg and fluctuate between 25 mm Hg systolic pressure and 8 mm Hg diastolic pressure. It is important to appreciate that the pulmonary circulation can traffic the entire cardiac output with a much smaller blood pressure gradient because the resistance of this circulation is much lower than that of the systemic circulation. 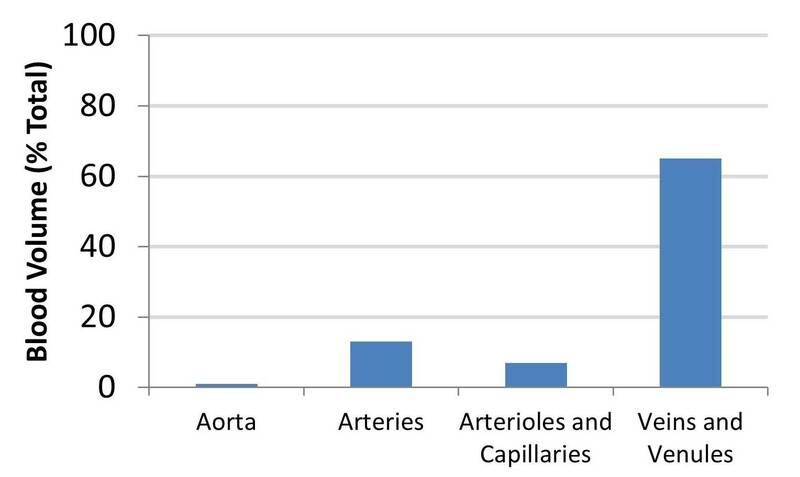 The graph below quantifies the total cross-sectional area of the different functional segments of the vasculature. It is clear that although each individual capillary may be quite thin, their total, combined cross-sectional area is enormous. This is a consequence of the enormously parallel arrangement of the circulation in which vessels progressively branch to form tremendous numbers of capillaries. A major consequence of this parrallelized arrangement of the circulation is that the resistance offered by the capillaries to blood flow is very low and thus the entire cardiac output can pass through them with a very small blood pressure gradient. 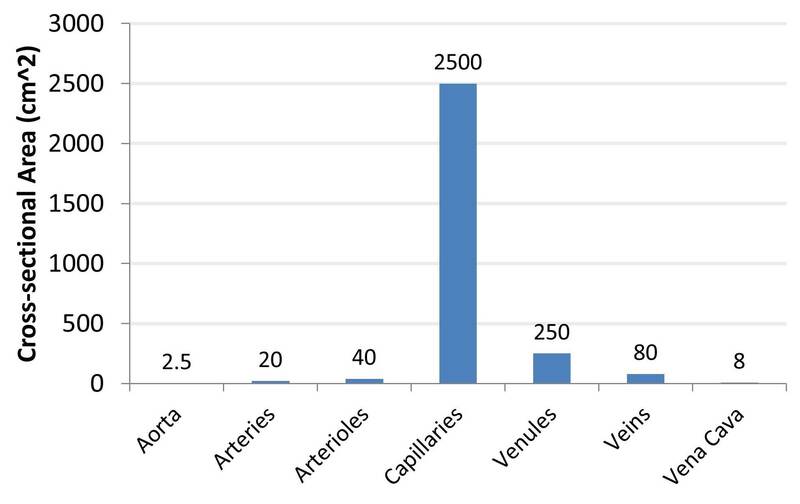 The graph below quantifies the total amount of blood volume in the different functional segments of the vasculature. It is clear that veins possess the majority of blood volume within the vasculature. This blood volume is largely held in reserve and is mobilized to meet physiological demands as described in venous physiology.